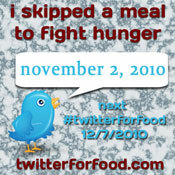 Another month, another amazing effort by Tim Blair and Twitter For Food in their ongoing efforts to utilize social media to end hunger. Looking at the End Childhood Hunger web site, and at all our monthly badges of support, we can’t really comprehend that we’ve been working with Tim and his supporters for over a year. Yes, we believe with Tim that, working together, we can change the world. This entry was posted in Advocacy, Hunger and tagged Charities, Donate, Food Bank, Global, Hunger, Twitter, Twitter For Food. Bookmark the permalink.